The deeper you dive into the health and fitness world, the more specific things can get. What starts for many as a journey into building a stronger, more muscular body, can quickly become a scientific study into rep ranges, set ranges, splits, macro nutrients, and ketosis. It’s quite the rabbit hole of information, some pieces being useful and some not so much. One concept that is quickly gaining steam in this world is Time Under Tension, or TUT. Scientists and fitness experts alike point to TUT as a way to create accelerated muscle strength and growth all while sticking with the same exercises. As stated above, TUT simply stands for Time Under Tension. If you hear someone at the gym say, “Bro, I logged a TUT of 40 seconds on that set,” they are just counting up how many seconds their muscles were literally under tension. So, if they were doing 10 reps during that set, that would mean that each rep had 4 seconds of muscle tension within it. That could mean that it took them 2 seconds to lower the weight, then 2 seconds to bring it up. Or, it could indicate that they lowered it for 3 seconds, then snapped it back up in 1 second. As long as each rep counted 4 seconds under tension, that contributes to the total TUT. One thing to be careful of here, though, is making the mistake of thinking that you can just take your total time for each set and divide it by your reps to calculate your TUT. Let’s take an exercise that we all have done at some point to illustrate what I mean. When doing a bicep curl, there are two parts to the motion: curling it up, then bringing it back down. Starting from the bottom, taking a slow, deliberate approach, you curl the weight up to it’s top position. What do you do then? Chances are good that you take a second to pause before bringing the weight back down. That moment, whether it be a millisecond or 3 seconds, doesn’t contribute to your time under tension, because you’re essentially resting before you bring the weight back down. Therefore, when doing any lift, be conscious of how long you’re pausing if you’re trying to create a larger TUT for your exercise. Only count the time that your muscle is being worked. Most often, this will only happen if you’re fighting gravity with your movement. If you’re lifting it up, or putting it back down, you can count those seconds toward your TUT for the exercise. Remember when you did your first set of bench press? If you were like most guys, you just wanted to get that bar down to your chest and back up as quickly as possible. Although this movement can still build muscles in the chest, arms, and shoulders, it’s not the most optimal way to do so. By taking your time from the top of the movement, then back up again, you’re putting your muscles under a longer window of stress. As you continue to hone in on this skill of slower, more deliberate and intentional movements, your muscles will begin to thank you. They’ll pop like they’ve never popped before when you look in the mirror, and you’ll also find it increasing your ability to lift heavy for some of the more traditional exercises. Why is that? It’s because when you slow up your execution of the lifts, you’ll engage more of the supporting muscles around the main one at work. You can see this for yourself right now by dropping down for some push ups. Rather than popping through as many as you can in a short amount of time, count to 2 on your way down, then count to 2 on your way back up. This extra time will create tension that will probably have you shaking well before you hit 20 pushups, and that’s because of those secondary muscles being put into overdrive. HOW MUCH TUT IS OPTIMAL? Time for the finer details. Just like different rep and set ranges can produce different results for your body, the amount of TUT you put on your muscles can vary what an exercise does for you. For instance, if you’re looking to get stronger, you’re probably going to follow a workout regimen that has lower rep ranges with more weight. Similarly, if you’re looking to strengthen your muscles, you’d want to keep your TUT at around 20 seconds per set. So, if you’re doing 4 reps, your time under tension should be about 5 seconds per rep.
seams of your clothes, you are going to want to increase your reps, decrease your weight, and increase your TUT. For each exercise that is aimed at muscle growth, you should look to keep each set within the range of 40-60 seconds of time under tension. 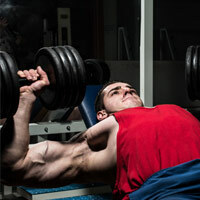 So, if you’re doing 10 reps on the bench press, you should look to keep your TUT between 4 and 6 seconds per rep. Although the amount of time under tension is about the same per rep than in the previous example, the total amount of time under tension for the set will help create the muscle growth that you’re looking for. Lastly, if you’re looking to create endurance in your muscles, you’re going to want to increase that time under tension to about 70-100 seconds per set. Similar to what was stated about muscle growth, your TUT per rep will probably stay consistent. But as you look to build muscle endurance, your sets will get bigger with lower weights, meaning more time under tension for the set, overall.